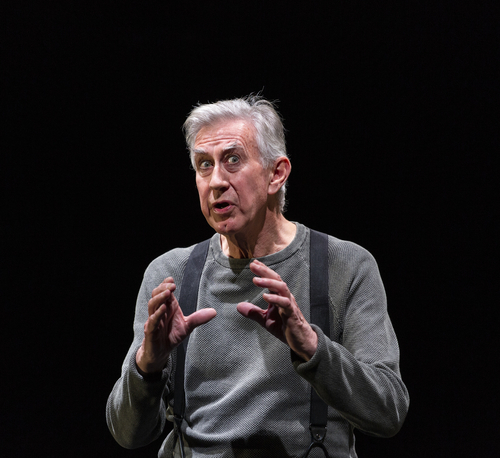 Barry McGovern in his programme notes says of Beckett’s novel Watt ‘it is one of the few books that have made me laugh out loud on public transport.’ It is easy to understand why as laughter was to be heard often throughout his performance. The production is adapted for the stage by McGovern himself under the direction of Tom Creed, and was first performed in Melbourne last year. The stage has the back wall painted a good shade of grey. Off centre there stands upright a railway porter’s trolley. There is a wooden chair towards the front of the stage; overhead there is a rectangular structure which is reminiscent of a roof in a railway station. Into this space Watt (Barry McGovern) arrives in the uncertain manner of a traveller alighting at an unfamiliar destination. He removes his coat and his hat which he places on the upright trolley and comes eventually towards a pool of light at the front of the stage. His shoes are brown but do not match which reflects one small part of the text. Watt is going into service with a Mr. Knott at his home in the vicinity of Leopardstown racecourse. McGovern brings the entire mise en scène alive in spell binding assuredness. He stands for the most part towards the front of the stage thereby creating an intimacy with the audience. He has a reverence for Beckett’s words and he enunciates them with the loving care of a man who knows that he is in possession of a creation of inestimable value. He navigates the repetitions with an easy charm but given its density it is an awesome performance. His body language and facial expressions all intensify the extraordinary journey on which he leads his audience. There was a unique a rapport between the audience and McGovern which creates a memorable theatrical experience. It lasts just under an hour. In McGovern’s notes he states ‘My earnest hope is that those who enjoy the show, and particularly those who don’t, will read the book’. Having been delighted by McGovern’s performance, it is now indeed time to read the book. It was a privilege to be in the audience.